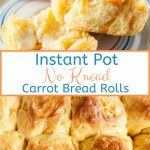 These Instant Pot No Knead Carrot Bread Rolls are soft, fluffy, and delicious! Beautifully yellow inside and studded with carrots. Done very quickly with no kneading. Perfect for Easter! A couple of months ago I wanted to make Challah. I searched online, found a few recipes, got all the ingredients ready and started mixing the dough. I put everything in my trusty KitchenAid mixer and turned the lever to knead. I unplugged and replugged the mixed multiple times. I moved that heavy and unyielding machine to the kitchen islant, then to a different shelf across the kitchen. Nothing! I ended up kneading the dough by hand. Which one is better? Properly kneaded dough will always win in flavour and texture in my mind but no knead dough is so easy that I turn to it more often than not. It’s easy, it’s fast, and you don’t need (or knead) a working KitchenAid mixer. 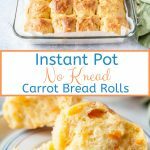 With Easter only a few days away, I wanted to create a delicious carrot bread roll recipe and adapt it for my favourite Instant Pot method. 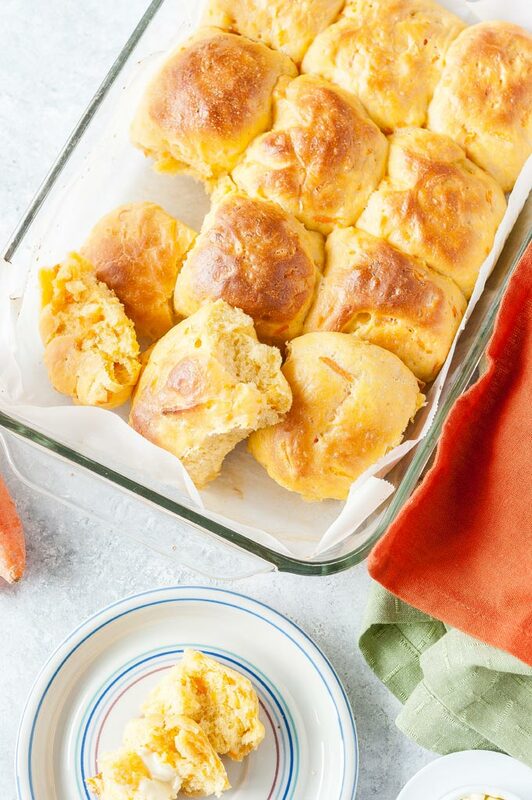 These Instant Pot No Knead Carrot Bread Rolls are fluffy and delicious. Beautifully tinged with orange colour and studded with carrots. 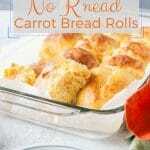 They have a faint carrot flavour and are just perfect for any dinner, especially Easter Dinner! When I was developing this recipe, I looked online to see if Carrot Bread Rolls were even a thing and apparently there’s some kind of a Finnish recipe that uses grated carrots, however, that recipe doesn’t have my secret ingredient that makes these rolls so beautiful. 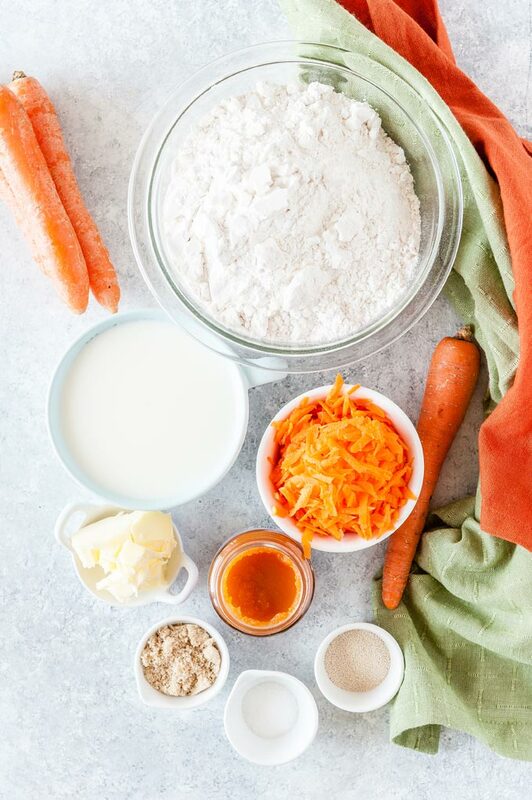 The ingredients for these No Knead Carrot Bread Rolls are pretty simple and what you would normally find in other bread rolls recipes with one exception. I call it my secret ingredient. 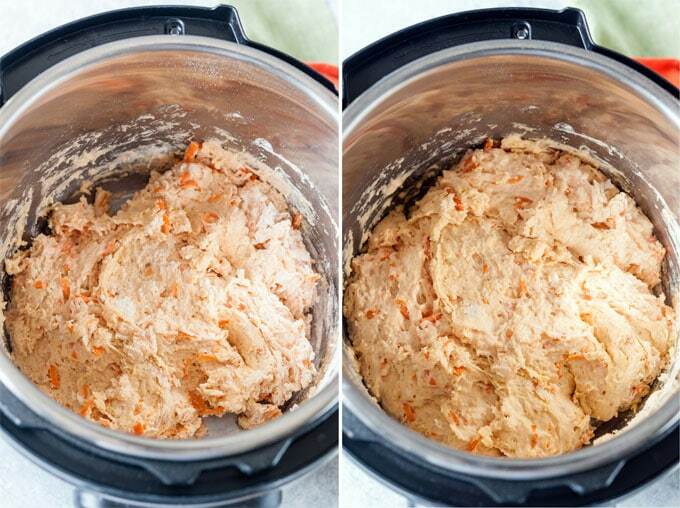 There are generally three main steps in making Instant Pot No Knead Carrot Bread Rolls (or any other Instant Pot No Knead Bread). Step 1: Mix the dough in Instant Pot with a spoon. Step 2: Let the dough proof in Instant Pot on Yogurt setting. Step 3: Shape and bake the bread rolls. 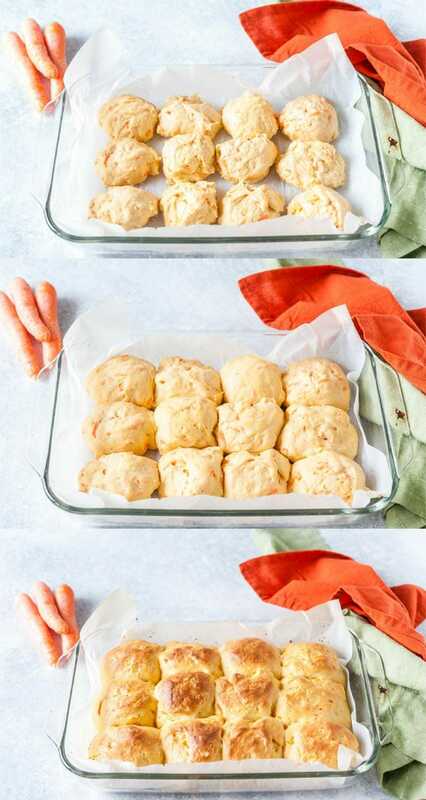 Now, even though the steps are quite easy, there are a few things to consider and a few tricks to make the process of making No Knead Carrot Bread Rolls easy. There are many recipes where you mix yeast with the flour right away. I prefer to let the yeast foam first and to do so you need to start with warm liquid. So, first you melt the butter using sauté mode of your electric pressure cooker. Then immediately turn the sauté mode off once half the butter is melted. Add the milk, sugar and, this is crucial, you need to make sure that the liquid is not hot. If the milk-butter liquid is hot then it will kill the yeast! So, either wait 5-10 minutes until the mixture cools enough to be just warm or even take the instant pot insert out of the instant pot and run the bottom under cold water to cool slightly. If you know that your yeast is fresh and you just used liquid that is too hot, then add more yeast and let it rise again (this will result in yeastier bread and the texture won’t be as great but you won’t waste the ingredients. I’ve done that a few times). After the yeast has foamed, add the secret ingredient – jar of baby food carrot purée! It will give the Carrot Bread Rolls a beautiful slightly orangy colour! Add the shredded carrots, flour, salt, and mix with a spoon just until all the flour is incorporated. I mentioned my befuddlement about the weight of a cup of flour in many posts on this site. In short, most sites claim that 1 cup of flour is about 120 g. Whereas after years of measuring my flour with different measuring cups on different days, I have never had 1 cup of flour weigh less than 150 g, and often 160 g.
So, I never bake bread by weight, I always bake bread by volume. But if you are doing weight-based recipe, then the 3 cups of flour that are required in this recipe would be 450 g or even 480 g. Not less! You need to have Yogurt button to proof dough in Instant Pot. I have been asked if Keep Warm function can be used and, unfortunately, it cannot. Keep Warm has a temperature higher than what is necessary to let the dough rise. So, once the dough is mixed right in your Instant Pot, cover the pot with a lid. You can use a glass lid or a regular Instant Pot lid. Then let the dough rise on Yogurt function for 30 minutes only! I found that letting this particular Carrot Bread Roll Dough rise for more than 30 minutes resulted in rolls that didn’t hold their shape too well. 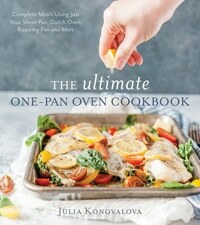 If you don’t have Instant Pot with a yogurt button and if you don’t need to make the bread the same day, then try my Universal No Knead Refrigerator Dough. You ix the dough in a bowl and then let it rise in the fridge overnight. It’s delicious! If your electric pressure cooker doesn’t have a Yogurt button, then I suggest letting the dough rise using a more conventional method. My favourite way to do so is by putting a bowl with the dough into a sink with hot water and let it rise for about 2 hours. Some people use a microwave to do the rising. I don’t have a microwave so I cannot attest to this method. I have also heard that some use their ovens to let the dough rise. I have never done that so I can’t comment on this technique. No Knead Dough is notoriously sticky. It will stick. There’s nothing to do about that! So, once the dough has risen, you can knead it by hand for 2-3 minutes, adding a bit of flour to make it less sticky. The more you knead it, the less sticky it will become. Or, and this is what I do, just make peace with the stickiness and roll with it. Yes, I am making a pun on bread rolls here! Not funny? Ok, moving on! Here’s a fun trick to working with sticky dough: water! That’s right, just plain good ol’ water! Get a bowl of water on the table and dip your hands in it a few times, it will make shaping the No Knead Carrot Bread Rolls so much easier. My other trick is to actually weigh the dough using my digital scale. This way I can get each roll to be the same weight and size. I love using half and half cream (10%) to brush the rolls because it’s easy and accessible and there’s no much waste. Of course, egg wash provides a better colour and shine to the buns but I find that there’s a lot of egg wash leftover usually and I hate throwing it out. You can also use oil or butter to brush the rolls. 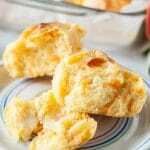 Bread recipes are quite forgiving and lots of ingredients can be omitted or replaced. All the changes, of course, result in slightly different flavour and texture. I love using butter when making bread but you can use oil (any kind really). 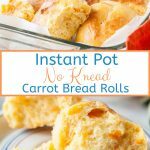 If you are planning on turning these Instant Pot No Knead Carrot Bread Rolls vegan, then you can use margarine or coconut oil. You can also omit the butter (or oil) but fat keeps the bread softer and adds to the flavour, so omitting any fat will result in dryer bread rolls. I like using dairy when making bread rolls. It adds nice mild flavour. You can use Cream exclusively or mix milk and cream. You can use non-dairy milk for a vegan version (for example coconut milk). Alternatively, you could use water but that will really change the flavour and texture of these Carrot Bread Rolls. I like using brown sugar for absolutely no reason. Brown sugar isn’t healthier than regular white granulated sugar. There’s also not a lot of it, so it doesn’t really affect the flavour… well, maybe a little bit. You can use white sugar, maple syrup, honey, or other sweetener of your choice. If you are trying to eat sugar-free, I would still use at least 1 teaspoon of sugar as you need it to help the yeast rise. But I strongly urge to not reduce the sugar, it really adds a nice flavour to the bread. Confession time: I always get confused by instant yeast or rapid-rise yeast. Technically they are supposed to be used differently and even in different amounts, but I’ve always used them interchangeably with no issues. 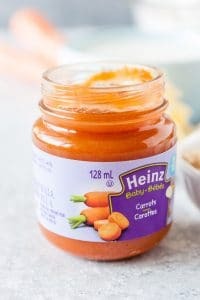 You can make your own carrot purée by steaming the carrots and then blending them with a little bit of water until very smooth. I just use a jar of store-bought baby food carrot purée. Make sure that it’s just carrots and not carrots mixed with beef or peas. If you cannot find carrot purée, then add an egg instead or a bit of yogurt but carrot purée really adds a beautiful colour and just a hint of carrot flavour. Also, it is a carrot recipe, so it would be strange to omit the carrot ingredient. Shredded carrots are, I would say, essential in Carrot recipes, just like carrot purée but they don’t add as much carrot flavour as the purée to the actual dough. 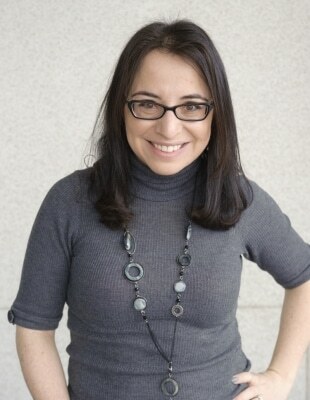 They can be omitted (although I wouldn’t recommend it), reduced or even a bit increased. Check my notes above about the weight of the flour. When I weight 1 cup of flour it always weighs 150-160 g.
I’m not big on salt and I usually don’t use enough. I started developing this recipe with 1/2 teaspoon of salt but increased it to 3/4 teaspoon. Most likely you could even increase it to 1 teaspoon of salt if you’d like. However, I prefer to just salt my butter or eat the rolls with cream cheese. Because these Carrot Bread Rolls are no knead, the wonderful and fluffy texture gets less fluffy the next day. I would very strongly urge you to eat these buns the day you make them. If you actually have leftovers, they will keep loosely covered on a counter for another 2-3 days but the texture of the bread will be different. If you’d like to read more about making no knead bread in Instant Pot then check out my post about Instant Pot No Knead Dinner Rolls, it has a lot more information, suggestions, and tips. It also has very specific instructions on how I form the bread rolls. Add the butter to Instant Pot and once it starts melting, turn sauté button off immediately. Let the residual heat melt the butter, then add the milk, and the brown sugar. Mix. IMPORTANT: The milk-butter mixture must be between 105F and 110F (40C to 43C) which is just above the body temperature. If the liquid mixture is too hot then you’ll kill the yeast and the dough will not rise. So, test the liquid with your finger or a thermometer. It should be warm but not hot. Add the yeast, mix, and wait for about 5-8 minutes until it foams. Add the carrot purée, shredded carrots, and mix. Add the flour, salt, and mix with a wooden spoon until the dough forms. 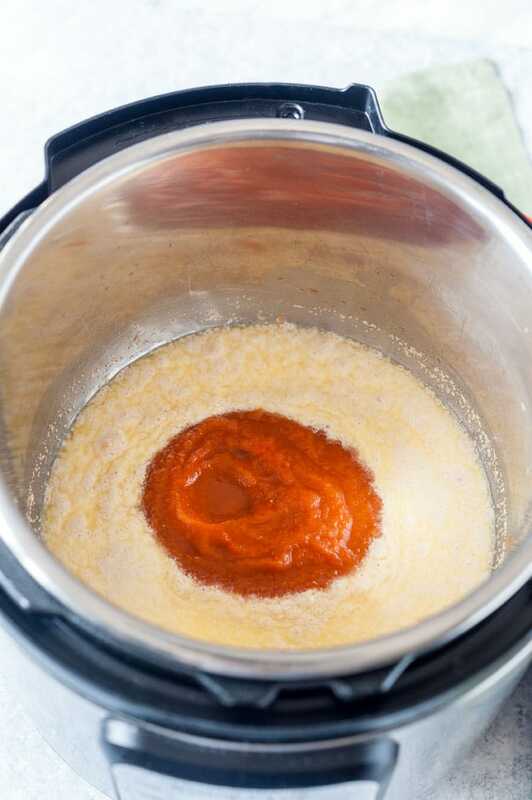 Close the lid on your Instant Pot, press the Yogurt function and change the timing for 30 minutes. After 30 minutes, open the lid. The dough should be soft, puffed up and doubled (or almost doubled) in size. Line a 13x9-inch roasting pan with parchment paper for easy cleanup. Knead the dough a few times. Divide the dough into 12 equal portions. I like to use my digital scale to do that. NOTE: the dough will be sticky! It is expected! Get a bowl of water and dip your hands into it periodically. The water will help the dough not stick to your hands. 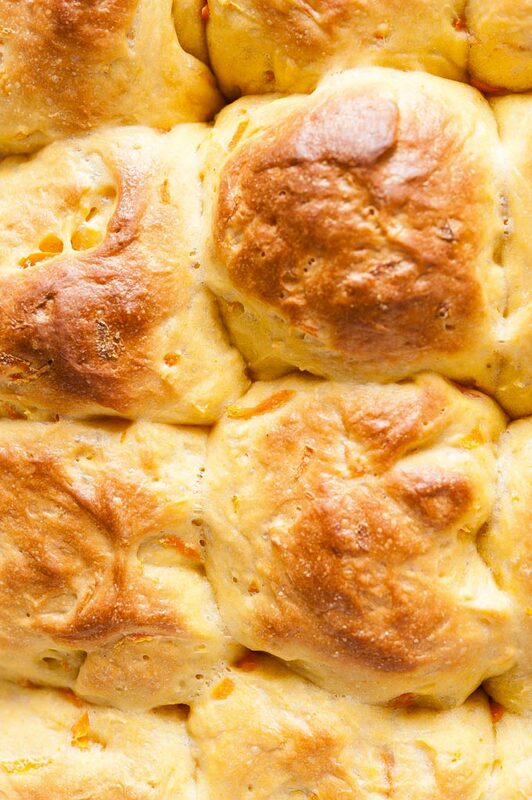 Shape your 12 equal pieces of Carrot Bread Dough into rolls. I like to flatten each piece slightly, now imagine you are wrapping something inside that dough by stretching all the edges around it like a balloon. This will form a nice ball with a "seam" at the bottom. Place each roll onto a prepared pan. 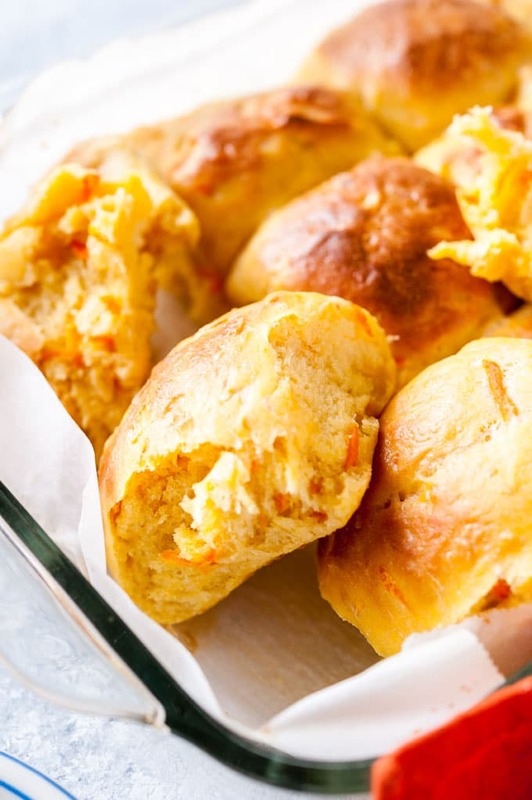 Cover the Carrot Bread Rolls with a kitchen towel and leave in warm place for 30-45 minutes or until the rolls are puffed up. Brush the rolls with half and half cream (or egg wash) liberally and bake in the fully preheated oven for 20 minutes. Turn your pan around midway so that all the No Knead Bread Rolls get golden colour evenly. 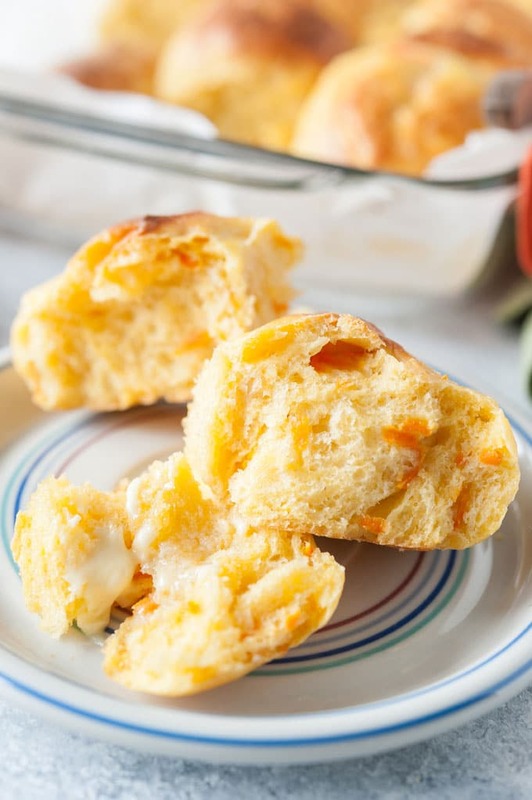 Please make sure you read all the notes and instructions in the recipe as well as visit Instant Pot No Knead Dinner Rolls post for more tips.